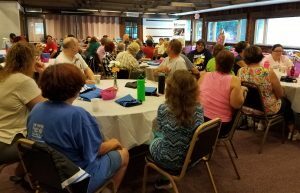 On Saturday, August 19th, over 60 guests gathered at beautiful Quittie Glen for Compeer of Lebanon County’s annual Friendship Picnic. Board President Glenn Wikel welcomed our friends and gave a short “State of Compeer” update. 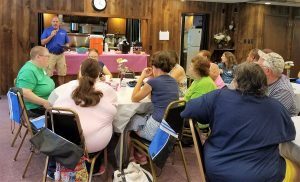 Among many highlights, he noted that this year Compeer exceeded its goal of making 10 new friendship connections! 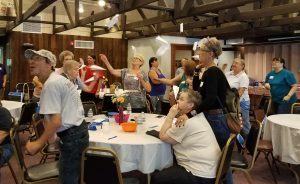 Glenn also highlighted Compeer’s newest program area – Compeer Support Services – that Compeer began in January, holding bi-weekly support groups at our office location. 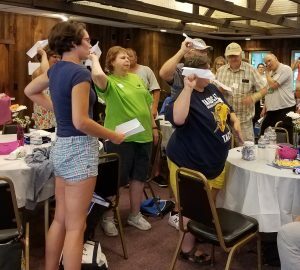 Glenn lead our guests through a great get-to-know-you game that involved paper airplanes. Friends wrote questions they’d want a stranger to ask them…then a 3 minute airplane storm zoomed around the pavilion! Guests then tried to match the airplane they had with another guest and learn a little about them. This was a fast and fun game! Guests ate their fill of hamburgers and hot dogs, potato and garden salad, and baked beans. A special treat was a visit from the Lebanon County Dairy Junior Princesses and Li’l Misses: these four young ladies shared a lot of facts about the dairy industry and how nutritionally amazing cow milk products are. And best of all, the princesses served bowls of ice cream to our guests! Alane Stief (Executive Director) and Jill LaRoche Wikel (Volunteer Coordinator) recognized the excellent service our volunteers give to our clients when they give the gift of friendship. Volunteers received an umbrella as a token of thanks. Jill also recognized two 5 year anniversary matches – that’s five years of memories and friendship shared by four wonderful folks! 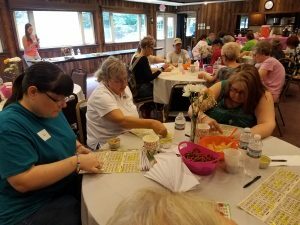 Our day ended with a rousing game of BINGO. Lots of guests took home some fun prizes! A special thank you to our sponsors: Lebanon County MHIDEI, United Way of Lebanon County, and PA LINK. And thank you to the following area merchants for their generosity in supporting our picnic: Bruno’s, Brushstrokes on Canvas, E & E Discount Beverage Warehouse, Giant Food Store (Lebanon), Laudermilch’s Meats, and Palmyra Bowling and Sinkhole Saloon.